All reports agree that, on this day of blistering sunshine, there was a pause in the fighting at noon. It was a pause to recover breath, but the allied commanders were also determined not to weaken their position by pressing too far forward on their left before the right wing had begun to put pressure on the Ottoman defence. Concealed by the folding of the ground, and the thickness of woods, the pace of the Polish advance was difficult to estimate; it certainly appeared somewhat slow. But no one underestimated the importance of these troops, who were expected to come down the Alsbach, a tributary stream descending to the houses at Dornbach and ultimately to Hernals: a line of march which would bring the attack much closer to the main Turkish camp and to the Grand Vezir’s headquarters. Some historians have blamed the Poles for their sluggishness, but it would be more helpful if evidence were found which explained why they were sluggish. Many Polish detachments were well behind the regiments of the left and centre already on the previous day, and can only have reached the upper ridges late in the evening, hungry and tired; there are no records which show how complete their preparations were during the night of 11th September. Even in the case of the German regiments put at John Sobieski’s disposal, it is known that they were in position on the Galitzinberg—well forward, and on the extreme right—by the time serious fighting began in this area, after midday; but it is not known whether they were already in position in the early hours of morning. 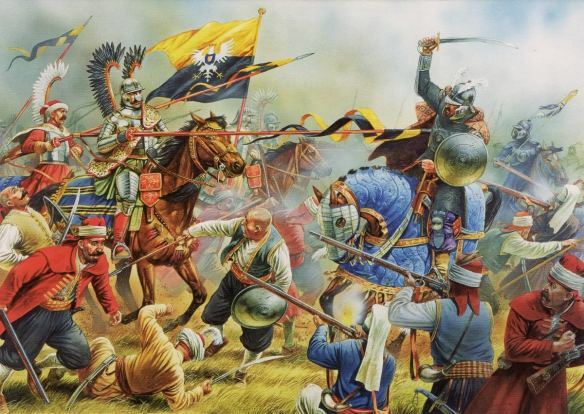 Another possibility is that, when the council of war ended on the 11th Sobieski was by no means clear that the attack would begin at dawn, and therefore did not give positive instructions to his officers to make ready for action. The Turkish raids above Nussdorf, in conjunction with Lorraine’s purposeful itch to try and relieve Vienna without delay, altered the whole situation. But it took the King of Poland most of the morning, while fierce fighting continued on his left, to advance his right wing. He was already past his prime as an instinctive war-leader, a slow and very corpulent man who now lacked the energy to dominate a crisis on the battlefield; nor were the discipline and promptness of his aristocratic cavalry generals very marked, in spite of their many other military virtues. Moreover, although it was a relatively simple matter to occupy the higher ground on both sides of the Alsbach, the descent of large numbers of men into the valley proved more arduous. Even then the greatest difficulty of all remained, to get them out of this narrow avenue of approach and reorganise them as a battle-formation, strong enough to meet a massive Turkish attack; the Turks were bound to try and interrupt and to crush the whole unwieldly manoeuvre. By one o’clock the Polish vanguard had reached Dornbach, where the woods and the slopes die away. They became visible to the forces anxiously waiting far away on their left. Shouts of joy and relief from the Germans saluted them, and dismayed the enemy. The heights on both sides of the Alsbach were in firm and friendly hands. From those on the left, the King himself directed operations, and he was in touch with the Franconian units and their leaders to his left. On the right Hetman Jablonowski commanded the Poles, some German infantry held the Galitzinberg, and a certain amount of support from artillery was assured. Fortunately the scattered Tartar forces still farther south were never a serious nuisance in this quarter. The future depended on the heroism and energy of the Polish centre under General Katski as it emerged from the narrower part of the Alsbach valley. First of all select troops of volunteer hussars advanced. After a momentary success the Turks pushed them back, and then the conflict swayed uncertainly to and fro. It cannot be stated with any certainty whether the final result was determined by the steady refusal of these Poles on the lower ground to give up the costly struggle, or by the efforts of German foot soldiers coming down from the Galitzinberg, or by the extra forces which Sobieski threw in (aided by reinforcements of Austrian and Bavarian cavalry) from the heights on the left. After a fearful tussle the Turks gave way; their horsemen fled, and took shelter with the Turkish infantry and guns on a defensive position farther back. Sobieski now began to deploy his whole force on more level ground, having swung them slightly round so that they faced south-east. They were arranged in two lines, the intervals in the first being covered by contingents in the second. As before, Habsburg and Bavarian cavalry stood behind them on their immediate left. There were more Polish horsemen and dragoons on the right. This achievement altered the whole face of the battle. The Polish wing of the army had caught up with the left and centre. It was a strong position, won after a hard-fought day. The great question, now, was whether to stop or to launch a further attack. Undoubtedly Lorraine himself wanted to press forward; and there is probably something in the famous story that when one experienced general, the Saxon commander Goltz, was asked for his opinion, he replied: ‘I am an old man, and I want comfortable quarters in Vienna tonight.’ Waldeck agreed. Sobieski agreed. They must have all based their hopes on signs of disorder and exhaustion in the enemy troops facing them. On one wing, the relieving army was two miles away from the walls of Vienna at their nearest point. On the other, it was a little more than two miles to Kara Mustafa’s headquarters in St Ulrich. Preparations to mount an overwhelming attack were made along the whole front. At 3.20, in the fiercest heat of the afternoon the action began again on the left. The Turkish position here ran along the Vienna side of the Krottenbach (a stream reaching the Canal near Heiligenstadt) but soon turned to the south-west, where it faced first the centre of the Christian army, and then the Poles. The Turk’s resistance was ineffectual, and they soon began to withdraw rapidly to the left wing of Kara Mustafa’s defence. 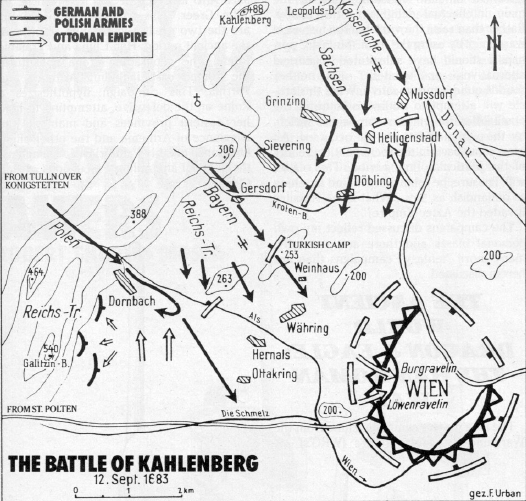 Some of the Habsburg troops at once made straight towards the nearest siegeworks of the city, others swung to the right. The same thing happened on the central part of the front: the Saxons, and then the troops of the Empire, pushed forward again—and swung to the right. The Poles had meanwhile thrown everything they had into their attack on the main armament of the Turks. For a short while the battle was doubtful; but the thrust of the Bavarian troops (under Degenfeld and Max Emmanuel himself), and then of other troops coming up from the more northerly sectors, weakened the flank of the Turkish position; the Poles finally plunged forward with their cavalry to sweep southwards. Here, other Turkish units made an obstinate stand; they had their backs to the River Wien, and when they finally gave way Kara Mustafa ran a real risk of being cut off by swift cavalry movements in his rear from any possible line of retreat. Meanwhile the bodyguards of the Grand Vezir resisted desperately when the Poles began to enter his great encampment from the west. On its northern side, Janissaries and other household troops were still fighting hard; the Franconians under Waldeck, and on his initiative, seem to have given Sobieski useful support in this final phase of the struggle. The total collapse of the Turks began, and when their soldiers still in the galleries and trenches in front of the Hofburg were instructed to come to the rescue of those in the camp, they fled. 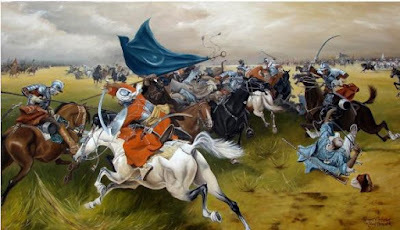 Kara Mustafa himself then retreated in perilous and disorderly haste, though he succeeded in taking with him the great Moslem standard, the Flag of the Prophet so vainly displayed on this bitter occasion, and the major part of his stock of money. Many other Turkish leaders and contingents had already left the battlefield several hours before; and so ended one of the most resounding of all Christian victories, and Ottoman defeats. By five-thirty the battle was over. Vienna was saved. The plundering began.